In my post on building a serverless URL shortener I neglected to mention API Gateway models at all. 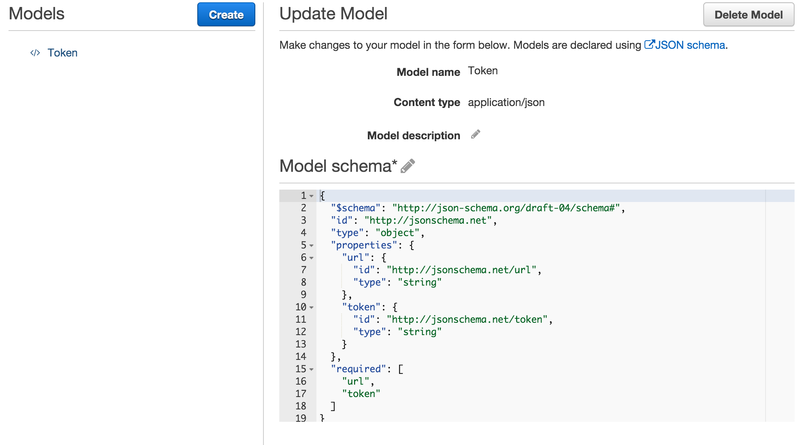 A model defines a JSON schema for data passed in or out of API methods. Models are assigned to method requests/responses. They play a role in data transformations that happen within mapping templates. Models are not used for validating input data. That seems like a logical use for them so perhaps they will serve this role in the future. You need to define a Model to select before adding a status code output. You can define models on the Models page. I’ve been able to stage API’s without a model despite this error message. You can get rid of the error though by creating a model. Within the API, click Resources -> Model. Add a model named “Token”. Add the following schema which defines an object with url and token properties.